World 3-4 is the fourth course of World 3 in Super Mario 3D Land. 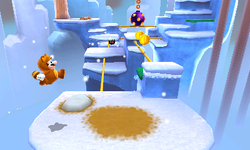 Mario begins on an area composed of several snow-covered platforms, divided by tightropes. Upon one of these tightropes is a Fuzzy. There are two tightropes after the next platform, one containing a Fuzzy and the other having a Swing Spike over it. Using the Mushroom Trampoline on the top of the next platform takes the player to a Warp Box leading to a ledge above the beginning area. Crossing the tightrope here leads to an area with the Checkpoint Flag on it. Two more tightropes are after this, both with Fuzzies on them. Past this is another area with two Goombas and another Warp Box. The next area requires the player to climb three tightropes, followed by another ledge with two tightropes and Fuzzies. The next tightropes after this contain Swing Spikes hanging above them. Following this is another tightrope, leading to a platform with a third Warp Box, which takes the player to the end area with the Goal Pole. Star Medal 1: Beyond the first tightrope is a tree. By using the Mushroom Trampoline at the base of the tree, the player can reach a tightrope. There is a ? Block and two Brick Blocks; using them as a platform takes the player to another tightrope, over which is another Brick Block and two Directional Blocks. These can be used to reach the Star Medal above. Star Medal 2: After the first Warp Box, by using a block which can be moved by hitting it, the player can reach a rainbow Jump Block leading to Coin Heaven. The Star Medal is at the end of this area. Star Medal 3: By riding atop a Flying ? Block near the end of the level, the player can reach a secret Warp Box, beneath which is the Star Medal.